There is no doubt that New Zealand has some of the most beautiful landscapes in the world. It is no wonder Peter Jackson chose New Zealand as the location for the filming of the Lord of the Rings trilogy. 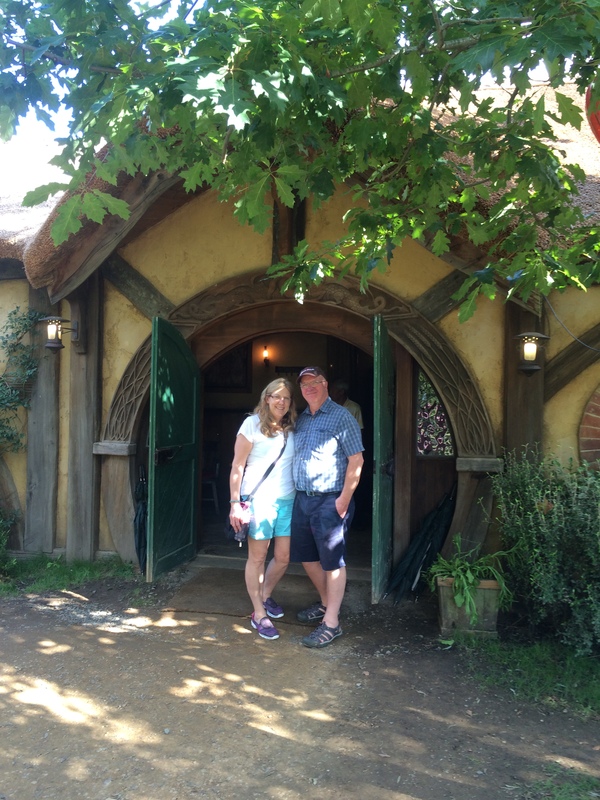 When we planned our recent vacation to New Zealand we had to include a tour of the movie set, smartly left in place by agreement between Jackson and the landowners. The green rolling hills of the North Island was the chosen home for the Hobbit shire and the famous Green Dragon saloon. Reservations are required in advance for tours, as it is visited by about 350,000 people a year. 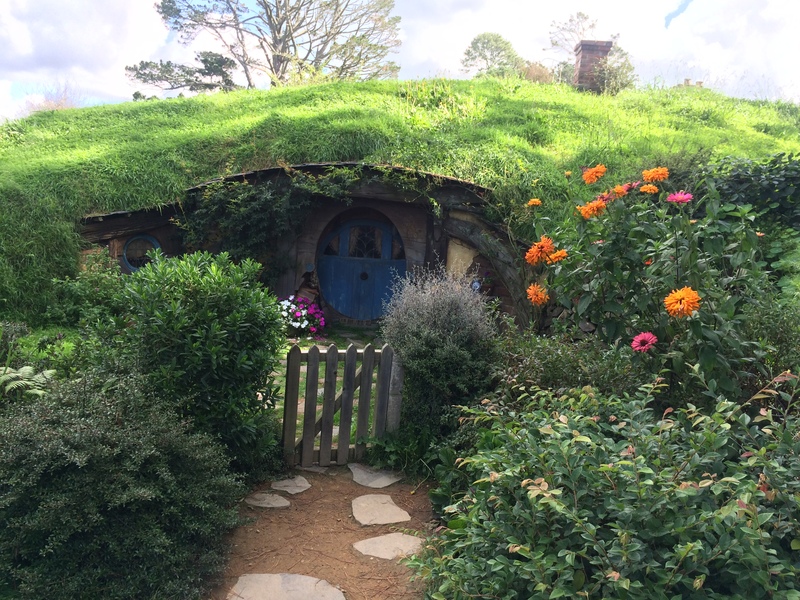 We took a bus deep into the countryside of the Waikato District in the farming community of Matamata to get to the set, now known as Hobbiton. 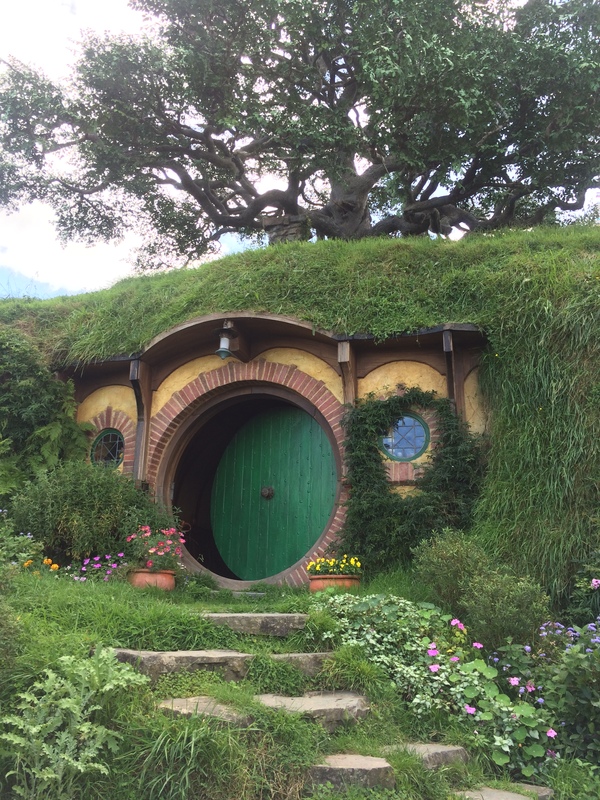 It is a mecca for fans of the Lord of the Rings movies, which were first released in 2001. New Zealand is known as the home of Middle Earth as depicted in these fantasy filled movies. 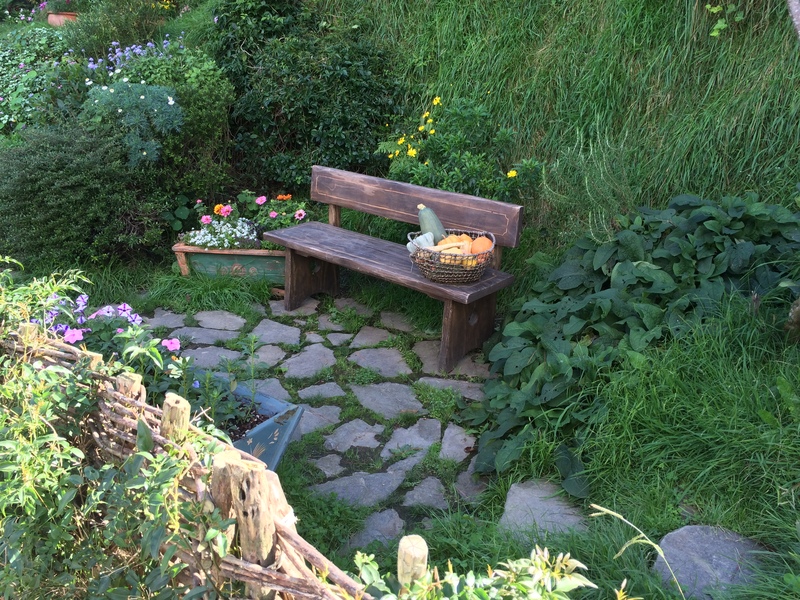 Over 150 locations throughout both the South and the North Islands of New Zealand were used for the filming of the movies, but Hobbiton was the only set left in place. Jackson loved New Zealand for its rugged mountains, rolling hills, dramatic waterfalls and streams, and the miles of unspoiled open landscape. The story is told on the tours, that Jackson’s location scouts flew over the Alexander’s sheep farm looking for a very large tree by a stream and were so impressed with the area that he negotiated the use of the farm to build the entire shire, which was the home of the Hobbits. The farm still has over 10,000 sheep and 350 to 400 hundred beef cattle on its approximately 1200 acres. 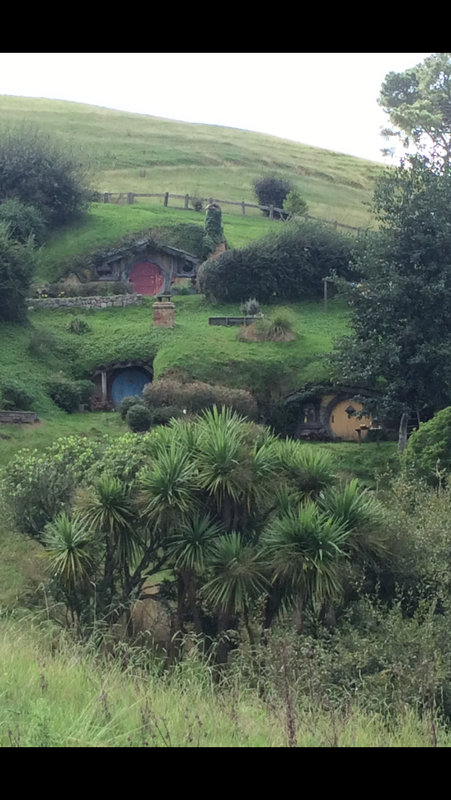 The movie set itself, consists of about 12 acres and contains 44 Hobbit holes, built into the hillsides. The Hobbit homes, surrounded by long lush grass, are scattered among the large trees and gardens. We visited in March. The sun was warm and bright in the deep blue skies above the shire. March is early fall in NZ and the shire gardens were full of large orange pumpkins and dark green vegetables. It looked as though they were ready for a fall festival. We looked for hours and took hundreds of pictures. The more you looked the more detail you recognized at each site. Each Hobbit home was set up to give you clues as to the occupation of the Hobbit who lived there. Some had carpentry tools and others had laundry on their clothes lines. Even now looking back at the pictures I notice details I had not seen before. Flowers, bushes, fruit trees and unique garden gates and painted benches everywhere. Some pictures I took just to have so that I could try to maybe replicate some of this beauty in my own gardens. 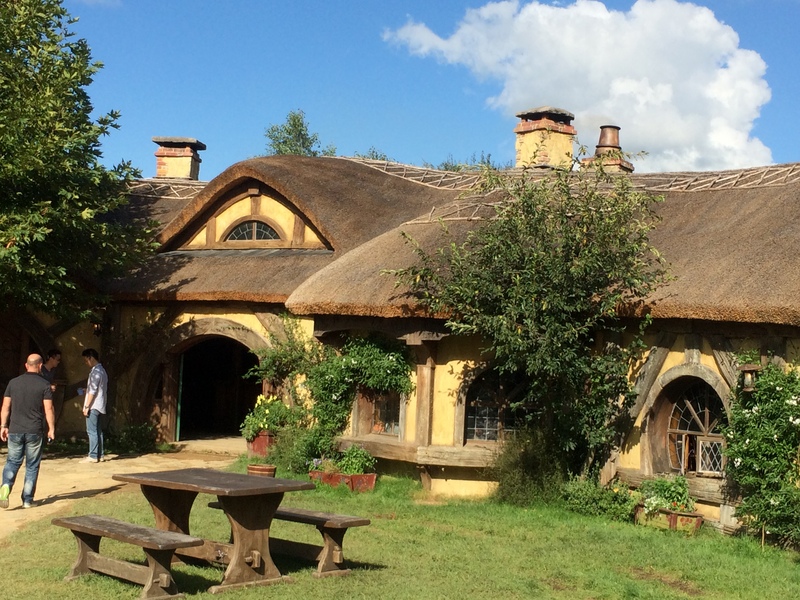 We spent an entire afternoon at the shire, learning about how they built the sets, how filming progressed for each movie and how the locals were enlisted to feed three meals a day to approximately 600 people working on the movies. 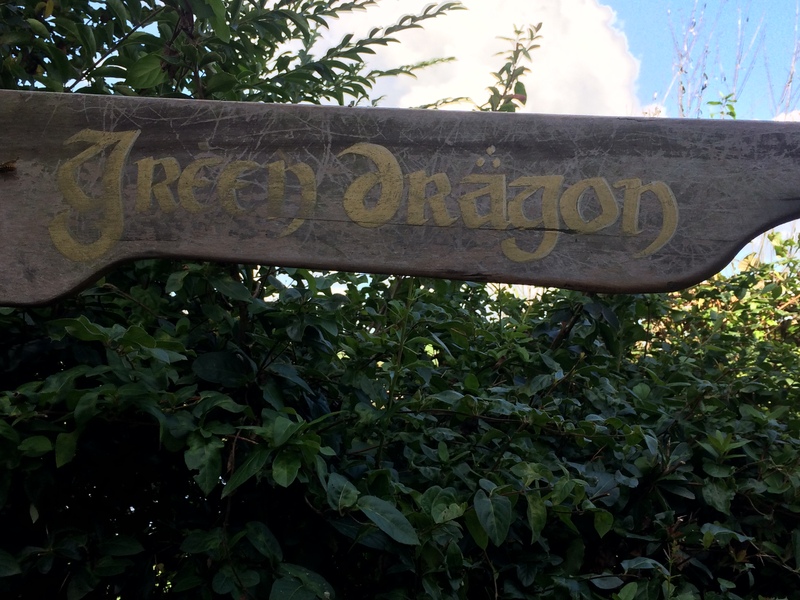 The tour ended as we went over a stone bridge and through the large double doors of the Green Dragon saloon. It was a hit with movie fans. The crowds of happy tourist fans filled the Dragon and the bartenders did all they could to dispense the ale, hard cider and ginger beer as fast as the taps could pour them. 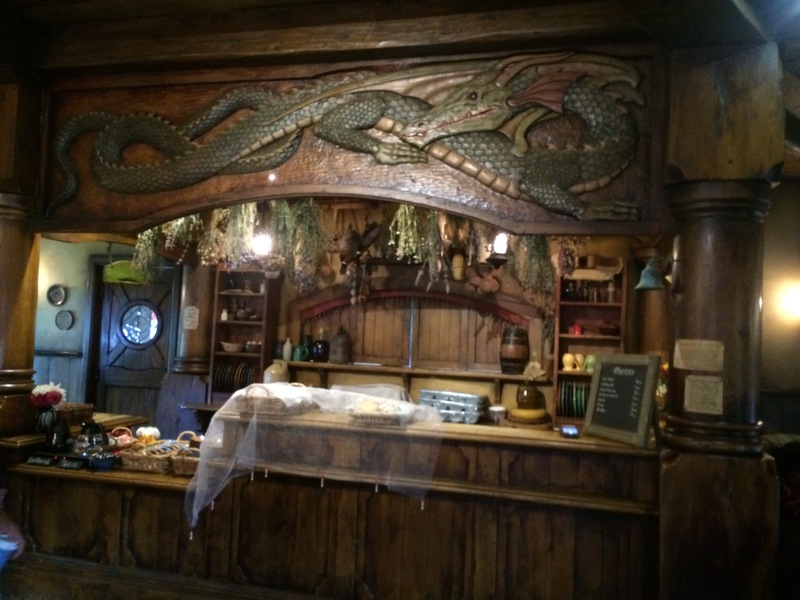 We grabbed a table with other people from our day tour after looking around at the oversized stone fire places and the famous wood carving of the Green Dragon above the entire west bar. We also booked a four wheel tour around Queenstown, NZ on the South Island which was also used for filming. We drove on the mountain roads and through the streams as our guide pointed out the Remarkables, a set of jagged mountains used extensively in the Lord of the Rings movies. Our driver would even stop midstream sometimes to cue up on his iPad, to show us the scene in the movie filmed in the area in front of our Jeep. It was such a fun trip and so fun to be on location of one of the most epic fantasy films ever made, from one of the best books ever written. English author, J. R. R. Tolkien wrote The Lord of the Rings and it was first published in 1954. The story was conceived by the author’s creative and limitless imagination, and then luckily he was also talented enough to be able to describe what he had created on paper into his books. Many years later, one of the most talented filmmakers, also blessed with that limitless imagination dreamt of making the epic fantasy novels into epic movies and did so with creative genius and creativity. Walking in and amongst the movie sets made us feel closer to the author and the filmmaker and brought the films and the books to life. Touching talent like this is rare and should be celebrated. On the surface it was one of the most beautiful locations anyone could be in whether there was a movie set or not, but when one contemplated J. R.R. Tolkien and Peter Jackson’s creativity and the bravery the showed in following their dreams to make this fantasy come alive for all to enjoy, it makes me appreciate the abilities that comes forward in all of us when we believe we can accomplish anything. I am sure they ran into road blocks and nay sayers on their path to success, but they did not let themselves be dissuaded in their quest to follow their dreams. By being a part of the magic we were reminded that there is no dream too big, and as we finished our tour of Hobbiton, in the Green Dragon Saloon, conceived in the mind of J. R. R. Tolkien and brought to life by Jackson in the movie, we raised our glass of ale to both men and to all those creative souls who fill our lives with fantasy and fun. We took time to appreciate them and be grateful! Be grateful in your lives for those things that make life fun.